Monday January 16th is moving day again. 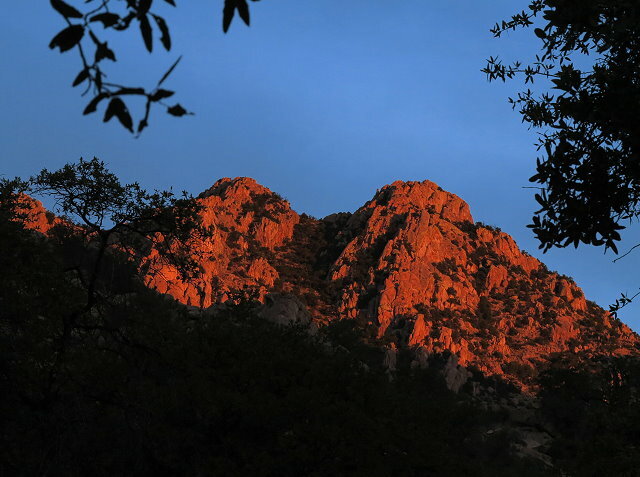 I am up in time to catch the first light on the Dragoon Mountain slope on the west side of the little canyon, Cochise Stronghold, were we have been camped for a week. 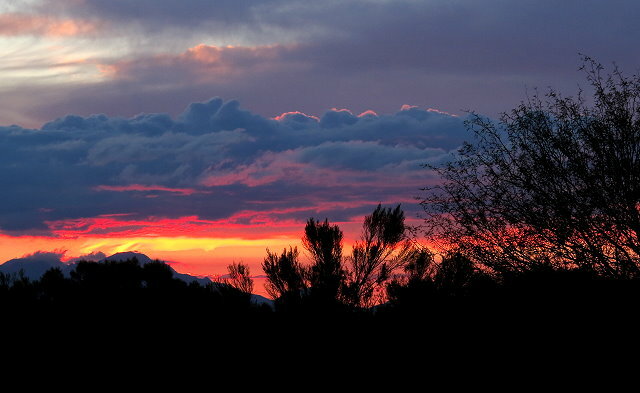 The color is especially rich and vivid, but only for a moment. This is one of my favorite places and I am sorry that we have to move on. 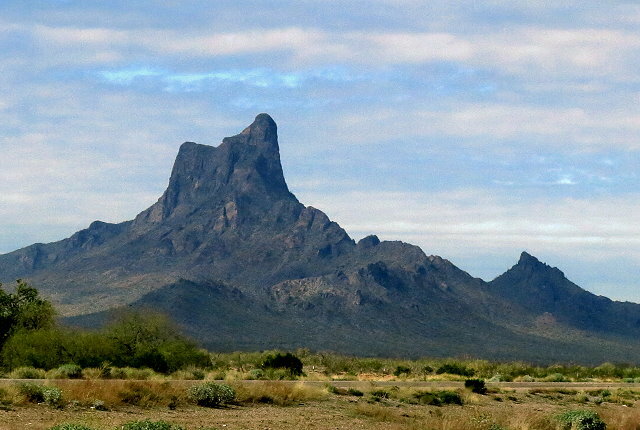 We take a different route out to I-10 and see a sign that says “Fissures May Exist” – not too encouraging when heading off into the wilds. But we make it safely through, not seeing any fissures. Once on I-10, the drive is especially hard because of the wind and so much traffic. 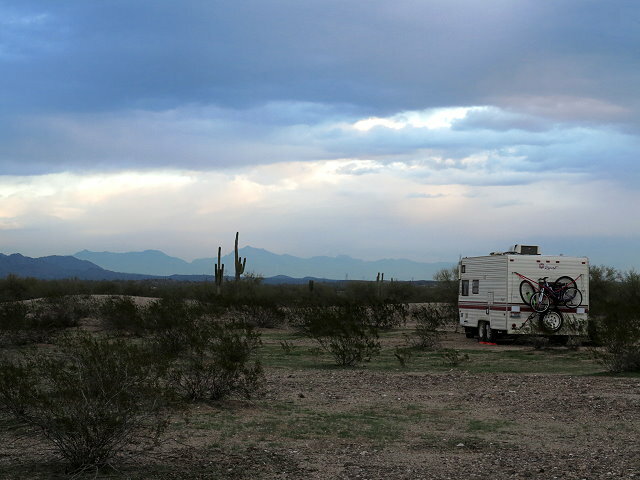 It is quite a relief to reach Synder Hill, the BLM dispersed camping area west of Tucson. 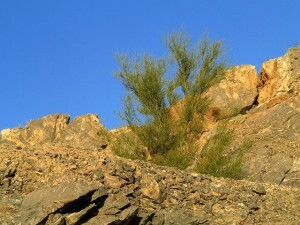 We drive around, looking for a spot to call home, finding a place with a couple of creosote bushes and a nice view of the hill. 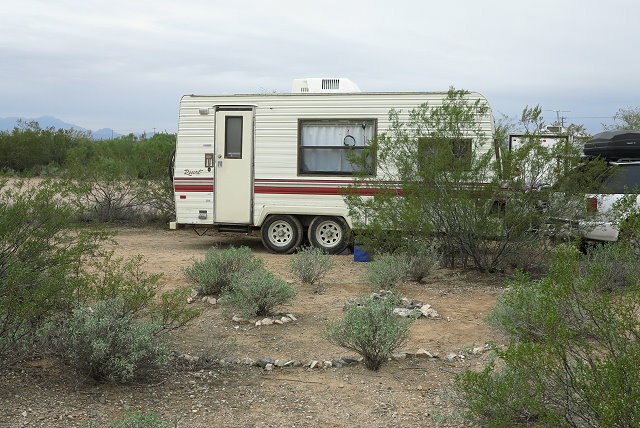 Even though we are only going to be here a couple of days, Clifford gets all of his ham radio antennas set up, while I make things homey inside. In the afternoon, I hike up the north end of Synder Hill to take photos at sunset. 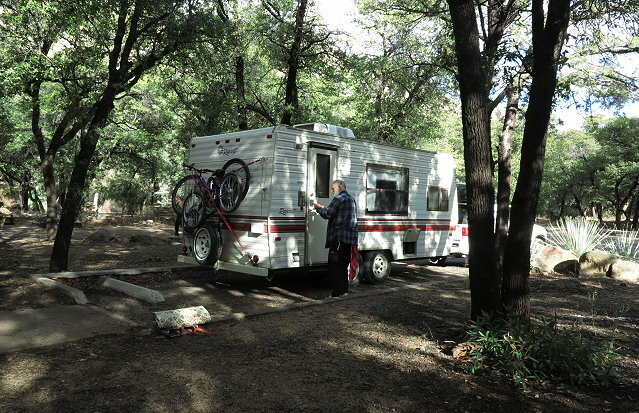 Even though it is not my most favorite camping place, it will be fine for the time we are here. 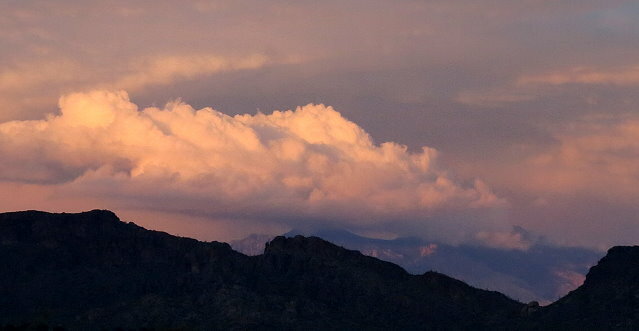 Tuesday January 17th is sunny in the morning with increasing big fluffy cumulus clouds drifting into the scene. After showers and breakfast, we get ready to go to Tucson. Our friend, Dan, arrives, as he is going in with us. They drop me off at the laundromat while they go on to Camping World to buy a sway-bar, a device that Dan recommends to help us be more stable and safer on the highways when towing Terry. When they come back to pick me up, we go to a Mexican seafood restaurant and have a really yummy lunch. Back at camp, we make plans for Dan to come again to help us pack a wheel bearing, as a bent axle puts stress on one wheel more that the others. Then Clifford and I sit in the sunshine, enjoying the light and the warmth of the afternoon. When Becka calls, I head up Synder Hill again, this time to a different spot and even more dramatic photos of the setting sun. Wednesday January 18th is a Tucson shopping day, taking advantage of Costco and Trader Joe, my favorite places to go grocery shopping. Back at camp, I put groceries away while Clifford naps and then hang outside to chat when Becka calls. Later I start packing, as we will be leaving in the morning. 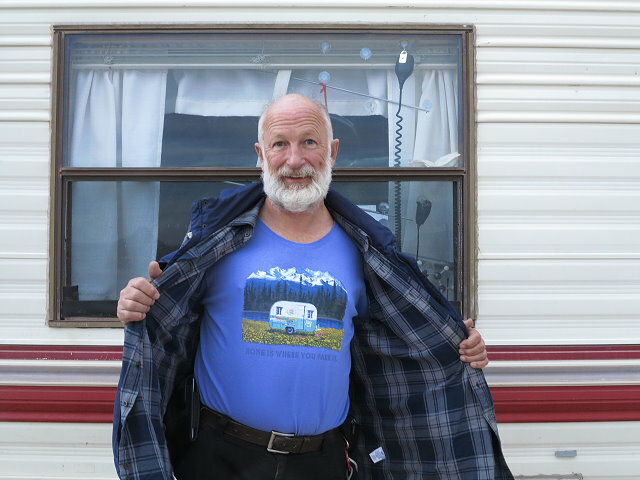 Thursday January 19th – Today is Clifford’s birthday, so I sing Happy Birthday to him when he wakes up and give him a T-shirt that says “Home is Where You Park It” with a design of a little RV. We finish preparations for travel and are ready when Dan comes to help pack the wheel bearing, which means that he did it while Clifford watched. He also helps us adjust the sway bar just right. What a neat special friend! Then we are on our way, with a stop in Gila Bend for gas, and Clifford helps some guys get their car loaded onto a trailer. 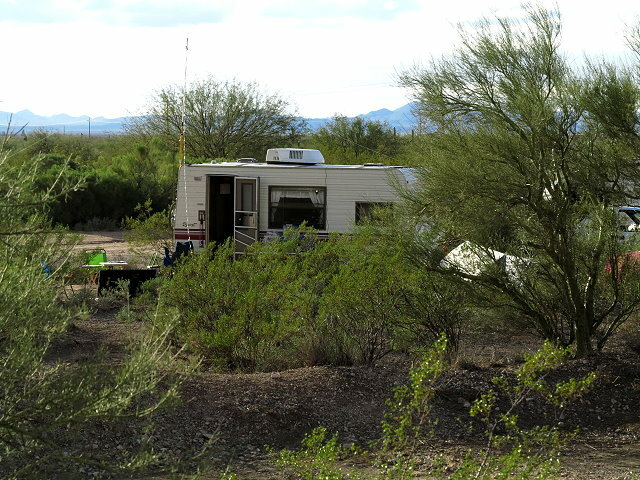 Then we head north to the Buckeye BLM dispersed camping area, driving out into the desert and finding an isolated spot to park for the night, with the nearest neighbors at least a half-mile away. I wouldn’t mind staying here for awhile, but we have a destination to reach tomorrow. 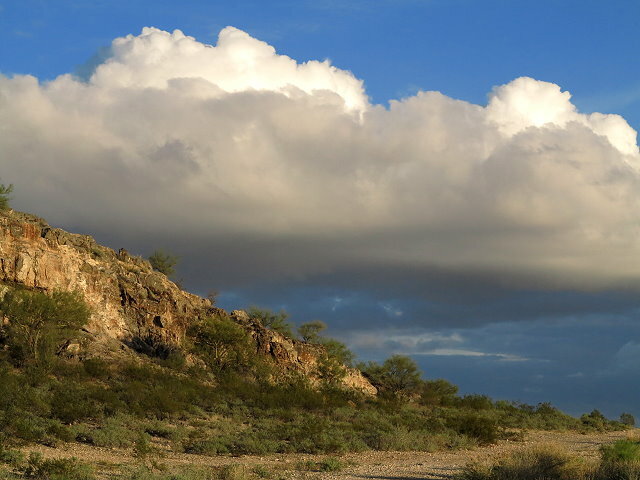 Regarding that “…rock formation before I-8 south of Phoenix” : WOW! 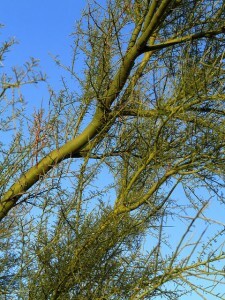 …That’s a visually IMPRESSIVE natural structure! It strikes me (for some reason-?) as kind of “scary”. 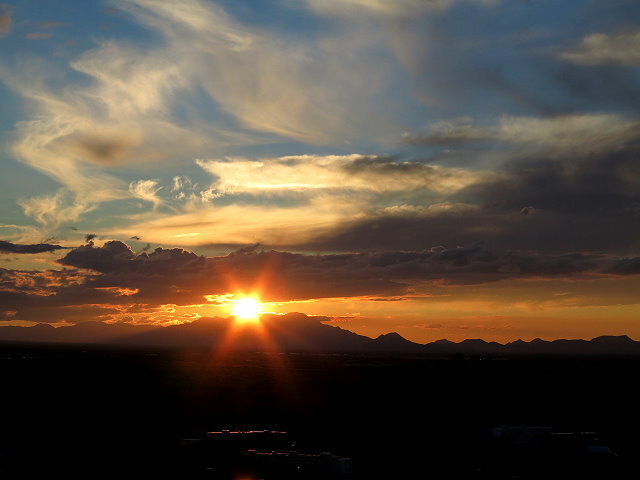 Love those sunsets! Such magnificent colors!